The Tusk Enduro Handguard is a durable plastic handguard with a universal handlebar mounting system to work on most motorcycles and ATV’s. Made from High-impact resistant plastic, these hand guards protect against roost from other riders. Uniquely shaped mounts are designed to fit on any handlebar without inferring with control cables. Durable plastic handguard blocks roost and brush. Universal mounting system for easy installation on motorcycles and ATV’s. Can be positioned independently from levers. Made from high-impact resistant plastic. Universal mounts are designed to fit on any handlebar without inferring with control cables. If you are looking for better protection, we would highly suggest going with wrap around hand guards. Product was exactly what I expected as Tusk makes a quality product at a good price. I ordered 2 sets one for my quad and one for my dirtbike. Good selection with multiple colors to match your unit. Would recommend to others to purchase and product arrived exactly when it was suppose to. 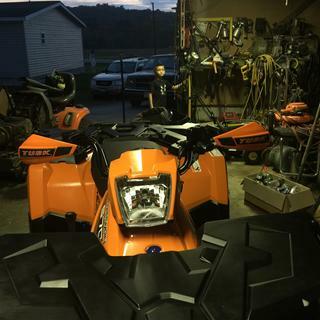 Great buy for youth atv or dirt bike. I just wanted something for riding through sagebrush and colder temps, but not as involved as full-coverage bark busters. I doubt they'll survive a major hit but for the money are a good deal. Very good product for the price....just what I was looking for....Lightning fast shipping made this even better...would buy again! racing Hare Scrambles I am missing trees by an inch . Sometimes not. I have video of these hand guards blowing bark off a tree. they only moved a little bit out of perfect adjustment but they are still going strong. Dont be fooled like me spending 80 bucks on Cycra rebounds. I went thru two sets of those and I cant use them anymore because they are wrecked.Note ; At first install of the tusk I thought. wow these are weak or flimsy but they work and I am glad that they are on my yz an my sons bike,also. Fitment was not good. They don't fit well and are not well built. I worked to fit onto the bars and had issues with the fitment by the levers. I removed and returned. 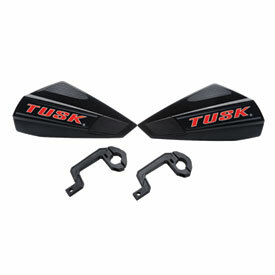 Spend the extra $5 and get the next step up from Tusk on the handguards. These made a great addition to my dual sport bike. I was looking for something to keep the wind of my hands and these do it for a great price. Great look great fit !!!!!!!!!!!!!!!!!!!!!!!!! Fairly easy to install, moderate protection. Seem a bit small, and they ended up not fitting on my Yamaha TW200 without having to move the controls inward on both sides of the bike. Mounted on my '03 Z400. Look to be sturdy enough for most of the branches/obstacles that I will encounter in S. OR. Would recommend as a first set. All plastic, but strong enough to flex and retain shape. My order arrived, we immediately put them on, that took a little bit of wotk. 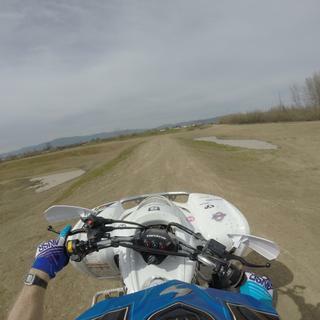 Took my quad out the next day and my hands stayed nice and warm. They work great and am very happy with them! I bought these believing that they would probably be a one time use hand guard. I have ran probends on my bike previously but didn't want to spend that yet on this bike. These "cheap plastic" hand guards have held up to a number of rides that had trails overgrown with brush, a few low speed get-offs, and general tree branches. These plastic guards flex and bend but have not broke. I will buy again. great value and easy installation. worth not having briars in my knuckles. Read other reviews on this product and although many said they would work with ATV's they really don't fit. They were an internet special but unfortunately you get what you pay for and they were not a good value. The sticker on one was wrinkled and put on wrong. -m-1997 HONDA CR125R-- They keep the wind off your hands pretty good but would still recommend wearing gloves while riding. My son wanted hand guards for his bike. Bought these and he couldn't be any happier! Looks great. Fits great. Now I need it to warm up some to test them. I like these hand guards, just wish there were a little bigger both height and length . Had a few small get offs with these and they have held up other then the plastic turning white. But for the price how could you go wrong. Why get your grips a n gloves muddy. I've been using these for about a year. Many crashes and tip over. I'm still surprised that they bent but never break. Guess I'll have to crash harder!!!!! If you don't need bark buster's these are the way to go. Another great Tusk product. I purchased two sets of these handguards for CRF50s. They look good and appear to be flexible enough to not break in moderate falls. One of the set came with nuts that did not fit the slot in the molded plastic mounts; I had to find some nuts in my collections that fit. I was also limited on how tight I could mount them because the nuts would spin in the slot. As a result, the handguards rotate with minimal force. I originally purchased to see if I could fit them on my 1996 Yamaha Wolverine. They plastic standoff brackets aren't quite long enough for them to fit over the controls on my ATV. They are now on my sons Honda CRF 70 and will workout just fine. They offer good coverage for his smaller hands and do easily bend side to side when dropping the bike. The guards appear that they'll offer protection from branches and such. They should last him for the time he's on this bike. Going to order the D-flex ATV guards for my quad, which I should have done in the first place. Easy to install, and will offer protection from wind and small branches. The brackets are plastic and the guards seem durable. Great buy for the weekend warrior that's on a budget. They survived a crash. I thought the plastic main mounting bracket was ridiculous at first, but it is very forgiving and tough. Price is great! The mounting brackets are kind of cheap, but for the cost of them you really can't go wrong. i really like the looks of these and they are pretty durable. The only problem i had was they were a pain to put on my kxf. These hand guards are really great! they hold up good and they look good too. I bought a pair for my 03 cr125 but unfortunately they did not fit my bars. If your bars are not stock then the mounts will not be big enough. luckily for me about 5 min and a dremel tool fixed that problem!9 you could probably use a file if you did not have this tool). I put them on and went to the race that weekend and managed to lay the bike down several times and they did not fail me once to protect my hands a little and my levers. If your looking for a hand guard to really protect your hands then these probably are not the right ones for you as they are made to flex. But if you do lay it down then it is better than nothing. by the end of they day they still looked brand new. I would recommend these to anyone, in my opinion its the best buy for the money, they look great and hold up surprisingly well. thumbs up from me! I will be looking to return these since they won't really fit on my 400EX, but that's my fault. However, not all of the bolts I received were long enough to install them. So I had to buy 2 other bolts and nuts to install with before realizing they wouldn't work well anyway. I did not expect much, but was still left disappointed. So that's kinda impressive in a way. I will most likely avoid Tusk products in the future. They're super easy to put on and they look really good. They aren't super huge and they never get in the way but still protect my fingers well. They're super durable you'll never snap one. the hardware seems a little cheap, but i wasnt expecting it for the price either. good product! The hand guards will not fit on the bars of TRX90X and therefore were useless. The problem Honda's welded perches and the fat plastic brackets, not enough space to mount. Cheap lesson learned. Would have rated higher because they would have been, cheap,easy to install, and look cool enough for a kid. Maybe I can repurpose them as fins on my trolling motor. Used these on a couple atvs wouldn't recommend for a Dirtbike, but they look good, and guard your hands. These fit well on my 2016 sportsman 570. Could beat the price. Flimsy, opt for the better ones, these will disappoint. When I bought these I was optimistic... they turned out to look great, but they are very very flimsy. they really don't offer much protection at all. I'm sorry to be the barer of bad news, but I would not recommend these. Sorry Tusk! When these where 10$ they where a amazing deal. Bought a set for my dads Polaris 850 XP and my grandpas Honda Forman 350 and they look nice! Won't fit many machines. If you have a hydraulic front break don't bother buying these. Master cylinder is in the way of the mount. They do what you would expect. Put them on my grandsons crf110f just to get him used to them for when he moves up to a bigger bike and ridgid bark busters. very good quality. very durable compared to other brands. I have landed on these several times with no problems. the mounting system is grate with the option of over or under the levers. the only complaint is the decals fall off when washing. this did not matter to me. Very nice. They are easy to install and do what they are supposed to. It appears that these only fit 7/8" bars. How can I modify to fit a larger diameter handle bar? Hello Eric, we have two sets mounted on bikes. A 06 YZ125 and a 07 CRF250r. Both have fat bars. They attach to the section of the handlebars that is still the 7/8" size. We have the mounts attached between the grip and clutch perch and between the throttle and brake perch. Hope this helps. You could put the clamps together and cut them with a hole saw on a drill press. Not sure if there is enough surface for that. Remember, they would not be as strong with that material removed. Maybe, maybe not. I have 7/8 bars on my bike but they Mount Up on the the smaller part of the bars by the brake and cluch perch. Tusk sells a big bar adapter kit. RockyMountain has them. Will the tusk hand guards fit on my Suzuki rm125 2003? Yes they should. They are pretty universal. I've used them on different bikes and quads. 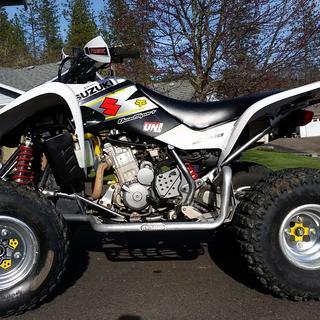 these handguards are designed to be a universal fit so they should fit on your Suzuki. Yes, they are a universal kit. Can't go wrong with the price and quality. Will the tusk hand guards fit a 2012 yamaha yz85? BEST ANSWER: Yes they will fit your bike. 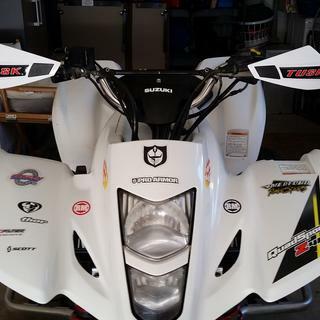 And will also give great protection from debris if you trail ride or race I personally think you will be satisfied with this purchase of these hand guards I purchase this my self and install them on my sons 2009 cobra. Yes they will fit any standard handlebars. They are plastic mounts, so not super durable. will these fit a DRZ400s with stock bars? Yes, they will work with your bars. You may need to adjust your levers a little. I have use them on my bike oversized bars and atv with stock bars with no issues. They will fit any stock bar. i have a 1994 Yamaha warrior its purple and kinda like a faded blue not classic Yamaha blue will this match my color? BEST ANSWER: I think it’ll look all right I have a blaster that’s all blue purple is a tough color to match but I think you’ll be OKEnter an answer to this question. Hell, your quad is already multi colored, any color can match. Besides, you can just take out the red "tusk" decal and leave it black. BEST ANSWER: Yes, these are sold in pairs. I have a grizzly 660 think they will fit? BEST ANSWER: Although these are primarily meant for dirt bike applications, they fit a wide range of handlebars and are pretty universal so I'd say there's a good chance they will fit on your Grizzly.